These unique, one-of-a-kind, fingerless gloves are pure luxury. Handmade from top quality, 100% Lambswool sweaters, they are comfortable to wear and very warm. 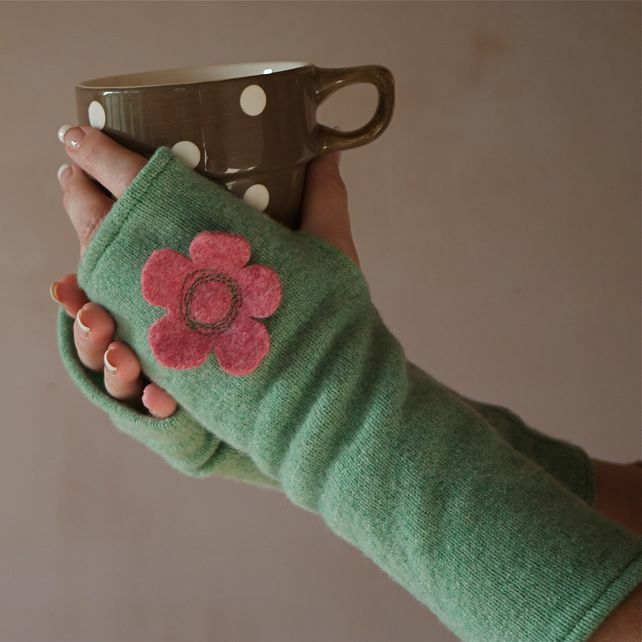 A gorgeous Apple Green, they feature a pretty appliquÃ©d flower in pink with contrast stitching. The perfect gift (if you can bear to part with them!) or affordable treat for yourself. And because they're ethically produced from recycled, 'green' sources, you can feel proud and smugly virtuous knowing that you're doing your bit for the planet. One pair only - when they're gone, they're gone! Folksy :: Buy "Snowflake Lambswool fingerless gloves "